It’s official. 29 days left. And that means all the things we meant to do in Nepal “at some point” need to happen now or it’s not going to happen at all. It also means that a lot of the things we’re doing are now also going to be for the last time. Now that we’re short on time we’re filling all our weekends with the things we want to do before we leave. Last weekend we escaped to Nagarkot for the last time. 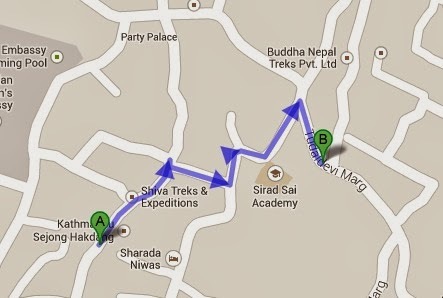 Peter and I hiked from Bhaktapur to Changunarayan and then nearly to Nagarkot, where we caught a bus for the last 6km. It’s the third time we’ve been there and it was kind of weird to tell the hotel workers that it would be our last time there because we were leaving soon and the rest of our weekends are full. 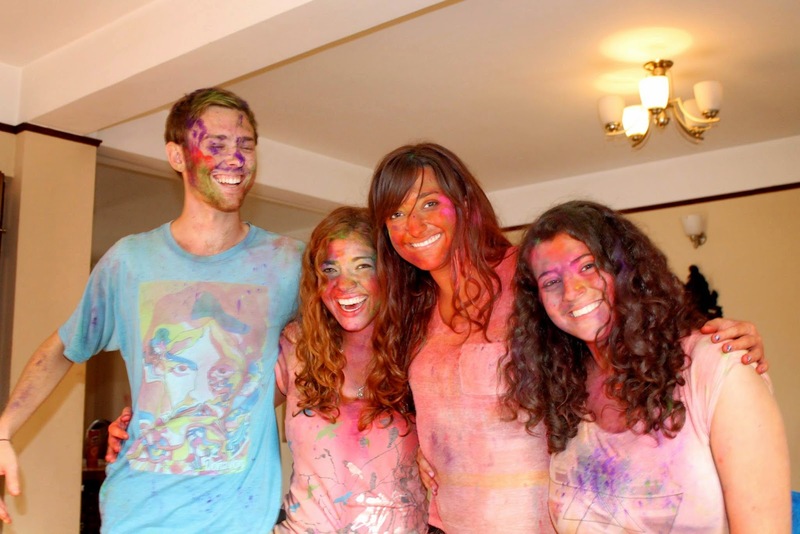 Two weekends ago, we also had the opportunity to participate in Holi, the festival of colours, which marks the beginning of spring. 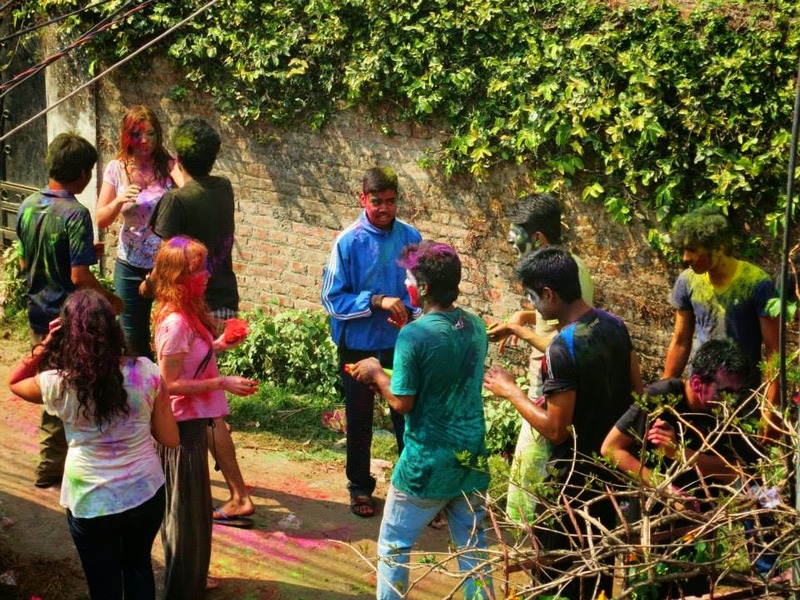 It’s celebrated in India and Nepal and basically entails a country-wide water fight with coloured powders being thrown at each other. Everybody was in such good spirits for the festival and I was also impressed with how respectful everybody was towards each other. Older people who did not want to participate enjoyed watching the fun from balconies and at one point, a woman wanted to get by the heart of the water fighting without getting covered. All the teenage boys stopped the fight, parted for her, and they wished each other Happy Holi as she went by before resuming the fight. Overall, definitely one of my favourite days I’ve had in Nepal. And just appreciate and experience as much as I can in my final month in Nepal! Watching the Olympics in Nepal has been very difficult because Nepal is not a country that follows the Olympics. Very few restaurants or bars have a television and then it’s off 12 hours a day when the power is out. I’ve only watched the Olympics one time so far on a TV (Snowboard Cross – my favourite event). Last night I skyped home and my family set a laptop in front of the TV so I could watch the hockey game. Otherwise, I follow the Olympics from Twitter. Although Nepal does not follow the Olympics, they actually do have one Olympian competing at the games. 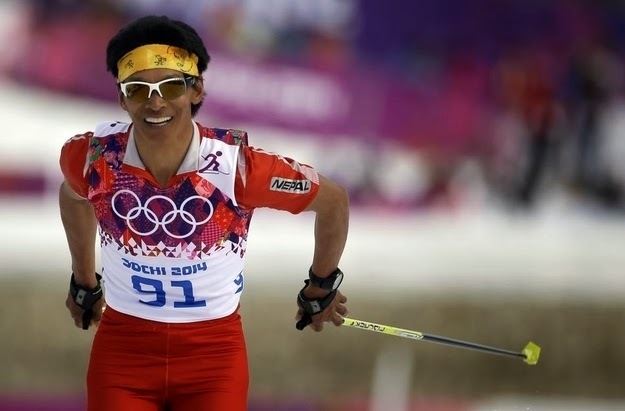 His name is Dachhiri Sherpa, he is 44 years old and he competed in cross-country. Going into the games, he stated that he expected to finish last, “but the placing is not important if I am teach young people in Nepal about the Olympic spirit. The spirit is in my heart.” Sherpa ended up finishing second to last. After the race, he and the event’s winner, Swiss skier Dario Cologna, waited for the last place racer to congratulate him on finishing. I think this is a great reminder of what the Olympics is all about. 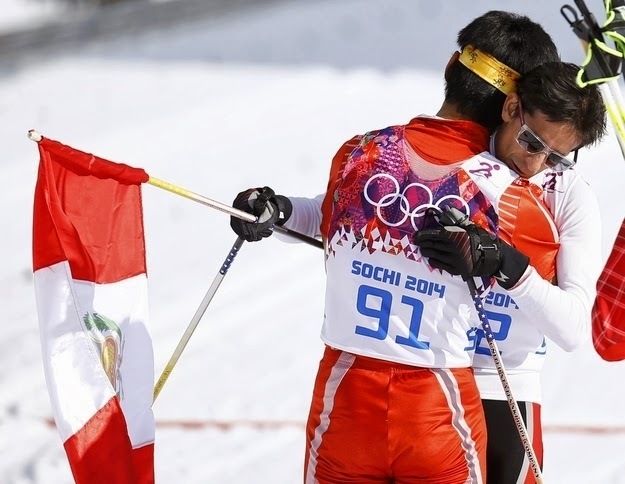 I love the competition of the event and cheering on Canada to gold, but I am most proud when we show good sportsmanship. When Gilmore Junio gave up his spot on the Canadian team to Denny Morrision because he thought Denny would do well (Denny has won 2 medals). Or when the Canadian coach gave a Russian competitor a ski after he damaged his during a cross-country event so that he could finish his race. That is the spirit of the Olympics and that is the attitude Dachhiri Sherpa fully embraces. 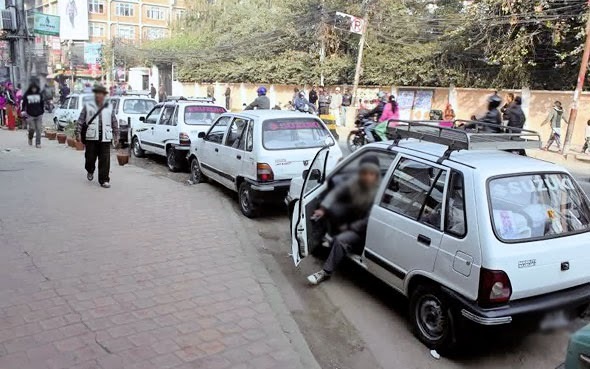 In Kathmandu, there are lots of choices for ways to get around but it’s very different than what I’m used to back home or even compared to other capital cities around the world. 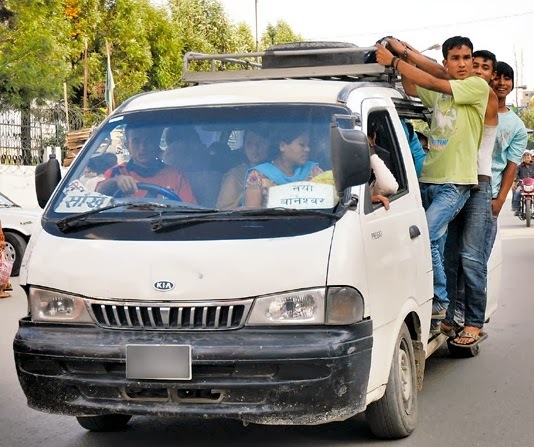 The roads in Kathmandu are almost all under construction so no matter what your transportation choice is; it will not be a smooth ride. Taxis are definitely the easiest way to get around, but they’re also the most expensive (although compared to home it’s nothing – a ride across the city will generally be under $5). With taxis, you have to make sure you agree on a price with the driver before getting in. We generally use taxis if we’re short on time, we don’t feel like cramming into the other modes of transportation, or at night when all the other transit systems stop and taxis have monopoly on movement, allowing them to almost double the price. There are tons of buses everywhere and they are often the best way to get where you’re trying to go. However, it can be a little difficult at times to figure out exactly which bus you need to take. There are no schedules and the routes are not posted anywhere. Each bus has an attendant who shouts out the side of the bus the places where it is going. Also, during rush hours it can be very crowded on the bus (especially the mini-bus) and I’ve ended up accidentally falling into people’s laps before and cannot get up. As well, one time when we took the bus to Bhaktapur (the city beside Kathmandu), we somehow ended up in another district, so it can be quite the adventure. 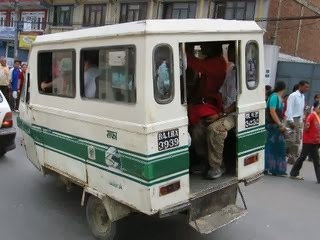 As far an public transportation goes, I find tuk-tuks to be the easiest because there is a stop right near where we live and we can take it across most of the city. It’s also generally less crowded and the stops are much more flexible. The tuk-tuk has a set route that it drives along but you can get off anywhere you’d like by smacking the roof to let the driver know to stop. I also really like that the tuk-tuk drivers are often women, which is not seen on any of the other modes of transportation. As a capital city, Kathmandu isn’t actually that large. I’ve walked across half the city before in only an hour or two and most places are walkable if you have the time (although quite dusty from all the construction). I plan to walk across both Kathmandu and Lalitpur (just below Kathmandu) on a weekend one day, and shop my way across the city. I also bought a bike to get around the city but I have discovered that it has not exactly been the best choice. I got a hole in the tire the first time I rode it from nothing I ran over. The last time I rode it, my pedal just fell off as I was riding and I haven’t fixed it yet. To deal with the bumpy roads here, a good mountain bike is pretty much required if you want the bike to stay together. It’s been a really long time since I’ve posted, but now, as the 3rd year Indev students are starting to choose placements, I thought I’d write about what a typical day on placement is actually like here. • I generally start my day waking up around 8:30am. I’m one of the lucky ones because my work doesn’t start until 10am and it’s really close so I don’t actually have to leave until 9:55am to get there on time. • At 10am I start work. I have my own cubicle there where I sit. How much work I do there typically depends on the week. Sometimes I’m actually out meeting with website developers a lot and some weeks I’m within the office the entire time. • Generally, I go to lunch somewhere around 12:30/1ish, either staying at the office, or meeting up with friends at CECI office. After lunch I return to the office and work until 5pm. • Right now, I go to Nepali language class 3 times a week at 6:30pm (2 days for speaking, 1 for learning the script). Generally, I leave early to catch the last TukTuk out of Baluwatar (around 6pm) and hang out at a coffee shop until class. • After class, we go to dinner somewhere. Right now we are 4 Indev students living at the CECI Passage House, as well as another volunteer, so we generally do meals out together. Most meals we eat out rather than cooking. There are lots of restaurants around where you can get a cheap meal (Some places you can find a full meal for under ~$1, while other more expensive places it can be closer to ~$5). We can cook at home but it isn’t that much cheaper and due to power outages (12 hours a day right now), nothing will keep long in the fridge. • After dinner we usually just hang out until we go to bed. We might watch movies or just talk, or skype with people back home. I go to bed pretty early here, usually by 10 or 11. In Nepal, most people go to bed by 9pm and we have actually been shushed for talking too loudly in the street at that time. • The weekends are when we have the most time to actually do things. We try to get out and do a little bit every weekend (even if it takes more motivation for some people). • I love getting out of Kathmandu as much as possible. Just to getaway from the pollution and the noise is so nice and I actually find I forget what peace and quiet is until I leave the city. 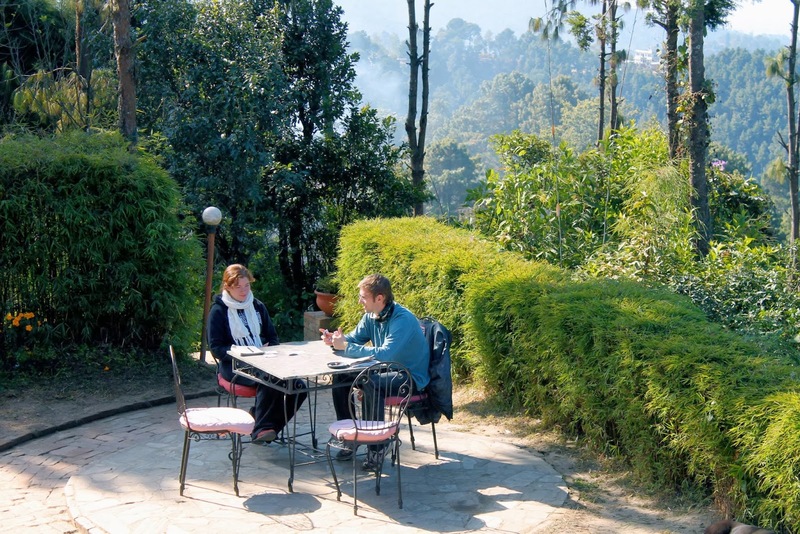 There’s lots of places to escape that aren’t too far away such as Nagarkot, Bhaktapur, etc. • Within Kathmandu, there’s also tons of hiking to do on the outskirts of the valley. This is one thing I want to do more because there’s so much to explore this way. 2 weekends ago, we walked up to a monastery that was very close to the city. • I love just walking around and shopping on the weekends when there’s no rush to go anywhere- there’s so much to see and I love the clothing here, it’s so colourful. I’ve bought a couple kurtas and a sari and I’m hoping to buy more before I come home. • Sometimes we’ll go out to a bar or club on Friday night. There’s not a huge nightlife here but there’s a few places where we can have a great night out. • Lounging. Probably what we end up doing most is just lounging around. At the CECI Passage House we have an amazing rooftop and I put up a hammock as well. So this weekend, we spent half of it just hanging out together on the roof, playing ukulele, reading, dancing, and chatting. Nothing wrong with a little R&R! This is just a quick example of the ways we spend our time here on placement. If you’d like more details on any specific aspects of life in Nepal, feel free to leave a question in the comments section. 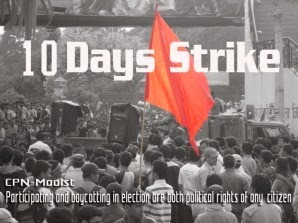 Today marked the first day of a 10-day bandh (strike) that has been imposed nation-wide in the lead-up to Election Day on November 19 and tension is increasing in the country. 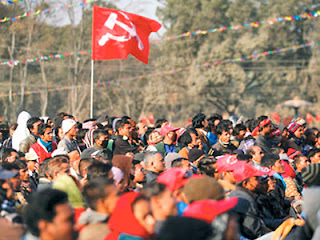 This election will be very important for Nepal, as it is the first election since Nepal became a republic in 2008 when the monarchy was abolished. At that time there was a Constituent Assembly elected but it was dissolved in May 2012 when it failed to make progress in drafting a new constitution. There have already been several attempts at a re-election but each time the election has been postponed. However, the Government of Nepal wants the election to occur so that the country can finally begin to move forwards, and security measures are increasing as the election approaches. Two-thirds of the Nepali army has been deployed for the election and the border to India will be sealed 2 days before voting takes place. The bandh that is occurring right now is an attempt by an alliance of 33 parties led by the Communist Party of Nepal (Maoist) to sabotage the election shutting everything down. Today was a general strike where all transportation, markets, institutions and industries were closed throughout the country. However, the next 9 days have now been changed from a general strike to only a transportation strike, so only travel will be restricted. Although 51 people were arrested today for bandh-related activities, the Maoist parties successfully enforced a strict bandh today and we’ve heard stories of vehicles that ignored the bandh being torched. As well, several IEDs and other explosives have been found throughout Nepal. Most have been targeted at election candidates but as the election nears some are being found in public areas. Luckily, nearly all the bombs have been found before triggered and few people have been hurt so far, but some people are concerned that violence will heighten as the election draws nearer. As of now, I am still going to work because I am only a five minute walk away, but many of my fellow volunteers here likely won’t be able to get to work in the next week due to the transportation bandh. This bandh is causing a huge impact on life in Nepal right now and it is still difficult to say what will happen in the next week. Some Australian volunteers in Kathmandu have been issued an evacuation plan in case the situation becomes violent but as of now there is now reason for concern. Right now we don’t know how the election will play out but it will be an interesting next couple of weeks. It’s incredible to be here in such a pivotal moment in Nepal’s history. 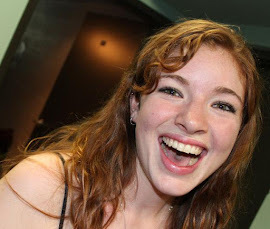 This blog is in no way reflective of the University of Waterloo, St. Paul's University College, or the INDEVOURS.